Mother’s Day came and gone. As usual, we made no special plans. In short, no celebrations. 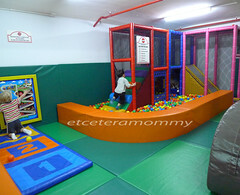 On Saturday morning we went to Fidgets, an indoor playground. We had been there for 2 consequetive weeks because lil Ryan just had so much fun everytime we were there. 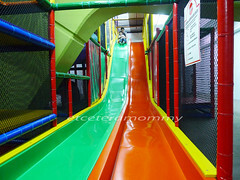 The week before, Ryan showed us how brave he was when he slid down this 2 storey slides by himself. I was taken by huge surprise when he did that. Frankly I failed to bring myself to do the same. Yes, I’m that scaredy. Having said so, this week he refused to repeat his achievement. 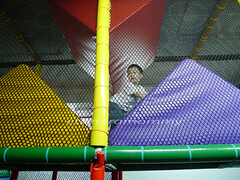 Instead, he preferred to slide down with Daddy. Hopefully not another scaredy cat in the making. On Sunday morning, all three of us woke up at around 9am. I threw the idea to bring Ryan out in the afternoon to hubs. He was indifference and gave no answer. Feeling lazy, I also did not persist. 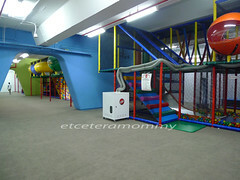 We went to Centrepoint in Orchard. Bought Ryan a dump truck and a 1 series BMW die-cast model to add to his collection. He was estatic. Little boy, so easily pleased. After a short stroll, we popped into Geox. They were having 10% discount storewide. How pathetic, 10% only. There was a pair of pumps I was eyeing but even after the discount, it’s still pricey. Grand Singapore Sale is around the corner, I may have more choices then. Afterall, I don’t have the soft spot for expensive shoes. (Bags yes… :P). So I came out of empty handed, whereas hubs leaving the shop beaming happily with a new pair of shoes for himself. So, on Sunday, Mother’s Day, we have a happy daddy and a jolly baby. Their smiles, their happiness, somehow mean so much more to me on this special day. 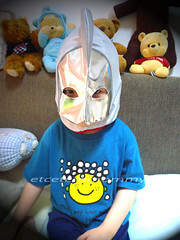 I am a happy mommy (wife) for sure and I hope my own mommy is feeling the same, always happy, always able to keep herself busy following her TVB and hokkien series. I may not say this everyday but I hope she knows eventhough I am now married, living in Singapore, may not be able to visit her that often and gossip with her about our neighbours, friends, yee ma ku che, etc etc… my heart is always thinking of her. Distance sets us physically apart but our hearts definitely grew fonder for each other. I do miss her and am utterly grateful and thankful for having blessed a mommy like her. She may be a strict mom, but thinking back, I wouldn’t be who I am today if not for her strict moulding to ensure I grow up a good kid. 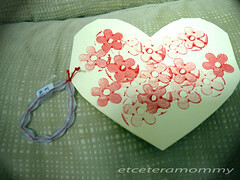 I love you, mom. 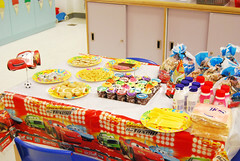 Sasha, the pretty momma, sent Ryan a pair of Ultraman PJs and lots of Cars stickers for his birthday last month. The PJs is still a little big but the mask fits nicely. Ryan absolutely loves it. Thank you soooo much! Buffet lunch at Marriott’s was so so. Their main course spread was not very impressive, appetiser and dessert were acceptable but could be better. Somehow I find the buffets in KL hotels offer so much more varieties. We spent a good 3 hours there. Had a blast of time until the captain had to interupt us to settle the bill as they needed the table for hi tea reservations. After we settled the bill, we dwelled on for another half an hour before we call it a day. I know.. what a bunch of uncooperative mommies but hey, we don’t get to do this very often, you know. Ironically I felt a little anxious on the days leading to Ryan school’s parent-teacher meeting on the 24th April. I even had insomnia the night before; afterall it was my maiden parents-teacher meeting. The time allocated for us was 9.00am. I brought Ryan along but for obvious reason he did not join the session. 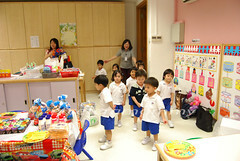 Sotong was tasked to entertain him while I was in the room with the teachers. The whole session took about 15 minutes only; partly because I had already been updated on Ryan’s day to day when I pick him up from school everyday. So the teachers and I were spending most of the time chit chatting on the curriculum in general rather than Ryan per se. Overall the teachers are satisfied with Ryan’s progress in class. Initially I was a little worried Ryan may be disruptive in class knowing how active he can be at home. 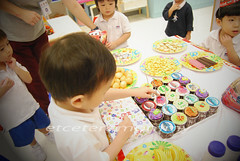 I was relieved of the teachers’ evaluation of Ryan being very attentive and participative in class. He knows all his colours, shapes and numbers pretty well. Ryan is also noted as a loving boy and mixes around well with all his classmates. Nothing much in particular. I was hoping to find out if Ryan has a ‘best friend’ in class but teachers feedback was he does not show any preference towards anyone in particular. Ryan’s Mandarin comprehension also markedly improved. Just the other night, he surprised us when he said “???? ne?” (what else – in Mandarin) when mil asked him over skype what else he learned in class. We were stunned when he said those words. All the while he’s only been using 1 – 2 words but never converse in full Mandarin. This is definitely the first! I signed Ryan up with a Mandarin enrichment class in May. So much has been heard about the school so I decided to give it a shot. 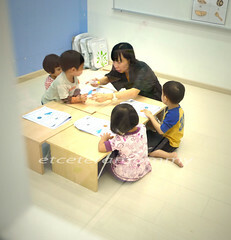 It’s only a 1.5 hours programme, once weekly at Berries Language Centre. After 4 lessons, I must say I’m pleased with his progress. Keep it up! 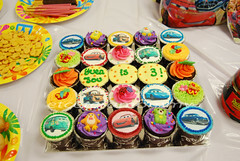 Ryan turned 3 about 3 weeks ago. 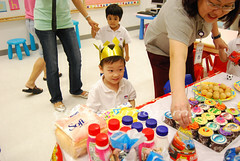 We organised a simple surprise party for him at the school. No other parents were allowed but my good friend Jean whose daughter is also in the same class, joined the fun. The teachers kept an eye closed. Ryan was not told about the party. I wanted (at least I tried) for it to be a surprise. 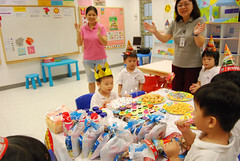 I guess the plan worked somehow as he was evidently stoned when he walked into the classroom upon seeing the cakes and other goodies. It was funny seeing his reaction. He tilted down his head (the paiseh look), eyes peered to where the cakes were and when he finally recollected himself, he ran straight to me. He actually asked, “mommy, what are you doing here?”. Hahaha.. so gotta.. A SURPRISE, indeed!